The heart is a vital organ of our body. It is the body that regulates our blood circulation and maintains a degree of purity of our blood. It takes oxygen-poor blood from different parts of the body and cleanses and provides distributed to everybody. Atherosclerosis a degenerative disease of the arteries characterized by patchy thickening of the inner lining of the arterial walls, caused by deposits of fatty material. A weak heart is commonly associated with a condition known as heart failure. Several common warning signs associated with a weak heart and heart failure include shortness of breath, coughing or wheezing that will not go away, accumulation of excess fluid in body tissues, tiredness, fatigue, nausea, lack of appetite, confusion and impaired thinking, and an elevated heart rate. Your heart tries to compensate for its lack of strength by beating more often to help deliver a sufficient amount of blood to your tissues and organs. All cardiovascular health conditions including heart disease are completely preventable. 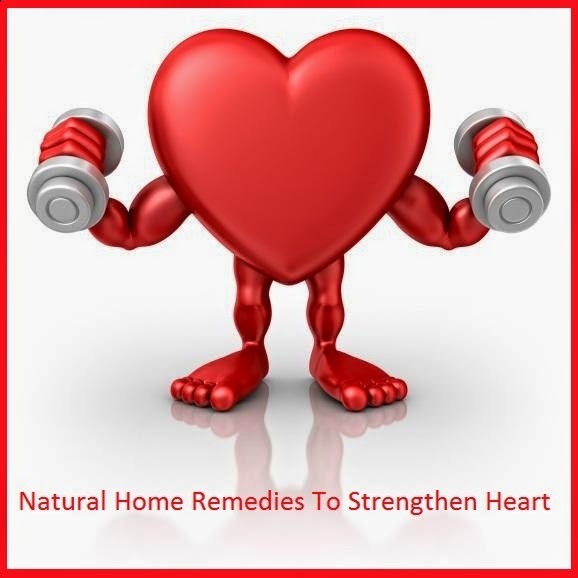 There are some very effective natural treatments for regulating and strengthening the heart. Here are some natural home remedies that will improve your heart health. Rub 11 peeled Almonds kernels, 7 Green Cardamoms and 10 gm dried European Berberis (Zereshk) and sugar candy to taste. Have it daily until required result. It is the most effective and natural way to strengthen heart without any side effects. One teaspoonful of Fennel powder mixed with one or two teaspoonful of honey acts a very nice tonic for the heart. It strengthens the heart muscles and improves its functions. Bake or make soft some Beet roots as required under hot ashes or hot wood embers for 30 minutes. Now mash and sprinkle Sugar candy powder to taste leave until juicy. Then squeeze all juice and drink this juice 3-4 times a day. It is highly beneficial in dealing with weak heart problem. Mix well 50 gm Coriander seeds powder and 50 gm Sugar candy powder. Take 5-5 gm twice a day. It is an ideal and natural treatment to strengthen the heart day by day. Mix 7 drops of Nigella seeds oil in 1 tbsp of raw Honey and consumes it on an empty stomach. You can also mix it in ½ cup of purified water and drink. It will be quite beneficial for controlling weak heart problem. Mix well 1 gm pure Saffron in 500 ml pure Rose water now take 1 tbsp add 3 drops of Nigella seeds oil in this mixture and have it twice a day. It acts like a heart tonic in increasing more heart health. Rub 10 blanched Almonds kernels, 10 Green Cardamoms 5 Currants and 2 tsp of Fennel in 500 ml pure Rose water. Then squeeze all juice from this mixture and drink this juice thrice a day. This is a 99% trial and natural treatment for weak heart. Mix well 1 part fresh Grapes juice and ½ part Sugar candy powder. Drink daily for a powerful heart. This is another instant and effective natural remedy to strengthen the heart. Gulkand or Marigold petal jam is a delicious delicacy. Gulqand is a sweet preserve of Marigold petals. Taking one teaspoon of Gulqand along with a cup of hot milk on an empty stomach prevents the any heart problem. You can also make Gulqand at home. Add 4 cups of fresh and organic Marigold petal in cup of Jaggrey powder and also add 4-5 green Cardamoms. Let it stand for 8-10 days and mix well daily. Put 20 gm fine and clean Raisins, 8 grains pure and fine Saffron, 200 ml pure Rose water in a clay pot and keep it in the dew drops at night time. Next morning eat along with rose water. This natural remedy is highly effective for treating weak heart problem. Mix well 4 drops of Garlic juice, 4 drops of Nigella seeds oil ¼ tsp Sugar candy powder, 2-3 tbsp of plain water and take this mixture daily. This effective natural remedy will offer a relief from weak heart problem quickly. After straining fresh Pomegranates (Anar) juice add Sugar Candy (Misri) powder and Fennel (Sounf) powder fill the mixture in clean and dry air tight glass bottles each bottle should be empty 1/3 and let them stand for 1 week in sunlight and keep stirring them daily and take it 2-3 tbsp twice a day. This syrup is very beneficial for enhancing the appetite and also useful for liver and heart. Mix well and boil one litre extracted juice of fresh Oranges, Sugar Candy (Misri) 1 kg, Common Willow (Bayed Mushk / Kastoori) 250 gm and Screw pine (Kewra) until content is dense let it cool and fill in a dry glass bottle and refrigerate. Give to the patient 20-40 gm along with water daily on an empty stomach. This natural remedy will be quite beneficial to strengthen the heart. Peel and make Soft some Carrots as required under hot ashes or cinders now cut in slices and place overnight to fall dew drops on them next morning sprinkle Sugar Candy powder or Honey and Rose water or Screw pine (Kewra) to taste on slices and give to patient daily. It is the most effective natural remedy for chronic weak heart problem. Put in a new clay pot 25 gm pounded Coriander seeds and ½ litre pure Rose water for overnight next morning after straining add Sugar candy powder to taste and drink on an empty stomach to relieve the symptoms of. Continue this remedy for at least 1 week for good results. This is one of the best natural remedies to strengthen the heart. Add 3 kg Sugar candy in 1 kg freshly squeezed Pomegranate juice and cook till dense now mix 250 ml pure Rose water let it cool. Take 50 gm of this syrup and stir in a glass of plain water and drink twice a day. This is a highly beneficial and trial prescription to strengthen the heart. Soak 25 gm Water melon kernels in 500 ml water overnight next morning rub in a mortar now filter through a muslin piece. Add Sugar candy powder to taste and drink thrice a day. It is a most effective & magical remedy to cure weak heart problem completely. Mash 2 ripe Bananas add 10 gm raw Honey mix and have it. This effective natural remedy will offer a relief from heart pain quickly. Taking any one of this Muraba Ash gourd, Carrot, Apple and Emblica goose berry along with a cup of hot milk on an empty stomach is a successful natural treatment to strengthen the heart. Boil 30 leaves of Australian Fever tree / Eucalyptol (Safeda)in 8 glasses of water until reduced by 3 glasses let it cool and after filtering it save in a glass bottle. Make lukewarm ½ glass of this decoction and give to the patient 4-5 times a day. It is a natural & magical tip to cure palpitation completely. Make a paste of 1 fresh Beetle leaf, 2 gm Nigella seeds, 4 peeled Garlic cloves and 3 gm green Ginger now add this paste in a cup of pure Rose water overnight. Next morning stir well strain and add 1 more cup of pure Rose water. Drink this at suitable intervals during whole day. This natural remedy works very quickly in the treatment of weak heart problem. Take 7 Ajwa Dates with their seeds (claves) and grind them and give to the heart patients. This natural remedy is guaranteed to work. Mix and boil 250 gm/9 oz French mary gold leaves juice and 250 gm/9 oz French mary gold flowers juice and 1 kg sugar candy powder till a dense liquid is formed store in a dry glass bottle take 2 teaspoons of this syrup along with ½ glass of water twice a day. This effective natural remedy cures all types of heart diseases. Arjuna is a coronary vasodilator. It protects the heart, strengthens circulation, reduces arterial congestion, lowers blood pressure and helps to maintain the tone and health of the heart muscle. It is also useful in stopping bleeding and to promote healing after a heart attack. Take ½ teaspoon (500 milligrams to one gram) 3 times a day along with raw honey and warm water or drink Arjuna bark decoction 20ml before breakfast. Boil 1 tsp Arjuna bark powder in a cup of cow‘s milk filter and add 1 tsp sugar candy powder mix well and drink lukewarm twice a day. This is a highly beneficial and trial treatise to strengthen the heart. Mix and boil 500 gm Spreading hogweed juice and 250 gm Sugar candy till a dense liquid is formed store in a dry glass bottle take 2 teaspoons of this syrup and 2 tsp pure rose water to mix in cup of water and drink twice a day. This natural remedy cures fast heart beat effectively. Grind 10 gm the young Banian leaves with 150 gm water and filter through a cotton cloth then add some sugar candy powder to taste drink twice a day. This effective natural remedy will offer a relief from weak heart problem quickly. Take 4 tsp Country mallow tree root powder with 1 tsp honey, 1 hour before meal, and twice a day for elders take 3 - 6 gm with 1 spoon of cow ghee twice a day i.e. in the early morning, at night before sleeping. It is the most effective natural remedy to strengthen heart. Grind the10 gm red silk cotton tree bark and boil in a glass of cow milk for 3 times. Add 1 tsp sugar candy powder and drink lukewarm, do twice a day. This is a highly beneficial and trial treatment to strengthen heart. Mix 10 gm Emblica goose berry (amla) bark powder and 10 gm Sugar candy powder and store take 5 gm above mixture along with water twice a day. This natural remedy cures all types of heart diseases. Boil 2 spoons small caltrops whole plant powder in the 2 glasses water, make it 2 cups take 1 cup juice added with 1 spoon of sugar candy powder in the morning and 2nd cup juice in the evening cures various heart problems. Drinking1 ounce butterfly pea leaves juice early in the morning cures all heart diseases. sugar candy powder drink early in the morning cures all heart problems. Grind 7 leaves of Country mallow tree with some water extract the juice add sugar candy powder to taste and drink. Fast heart beat caused by excessive heat will be cured. Mix and boil 500 gm maiden hair plant juice and 250 gm Sugar candy till a dense liquid is formed store in a dry glass bottle take 2 teaspoons of this syrup along with ½ glass of water twice a day. It strengthens heart and cures pain. Make a fine powder each of 100 gm basil, mint, Indian Sarsaparilla, Indian Ginseng (Ashwagandha) roots, Liquorice,dried organic rose petals and each of 20 gm green cardamoms, cinnamon, cumin, coriander seeds, dried ginger and 10 gm black pepper. Mix well and store in a glass container take ½ tsp add in cup of water and boil for 5 minutes strain add milk to the required quantity and sugar candy powder to taste. Drink 2 times a day. Worry, anxiety etc. will decrease and body, mind and soul will be at bliss and peace. Blood will be purified. Mind will be clean and heart will become strong.